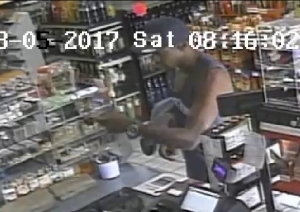 On 8/5/17 a victim misplaced his wallet and someone used his debit card to make fraudulent transactions, including one at the Hitt Street Mini Mart located at 111 Hitt Street. Video turned over to CPD has this person as a possible suspect. If you have any information regarding this person’s identity or whereabouts, please call CrimeStoppers at (573) 875-8477.